I decided to do a scrapbook page with the cute pics of Molly looking at herself in the mirror. But, I'm having trouble getting a creative thought in my head. So it's still sitting on my table unfinished. Dh and I bought this cabinet/hutch several years ago. I like the cabinet but never did like the color, so I was going to paint it. It's taken me all this time to finally decide that I want to paint it white. So, here is the cabinet finally finished, now I just need to get the hutch done. I'm moving like a snail on this project, but hope to have it done before the week is over. These are pictures of our master bedroom. It's one of my favorite rooms in the house. I love the wall color, which is Olympic 'Plantation Moss'. It's very soft and soothing. 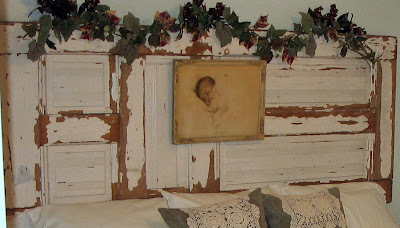 But my favorite thing in the room is our headboard, which is an old, chippy door we found in a vintage shop a few years ago. This is dh's dresser. I love this piece. We bought it new, but have had it for so long, it is now vintage! I think we're getting old! I love my dresser and the chair next to it. They both belonged to my mother-in-law, who passed away three years ago. They are very special pieces to me. Well, that's my little home tour for today! So far your page is looking really good, but is your table always that tidy? LOL... how about some paw prints on the page? Oh my word! what a STUNNING bedroom, I LOVE that headboard! You did a beautiful job! Stopping by to say Hi, enjoyed the tour and really like you headboard.